Our selection of solid wood Amish gameroom furniture will help you create a fun, visually appealing game room in your home. 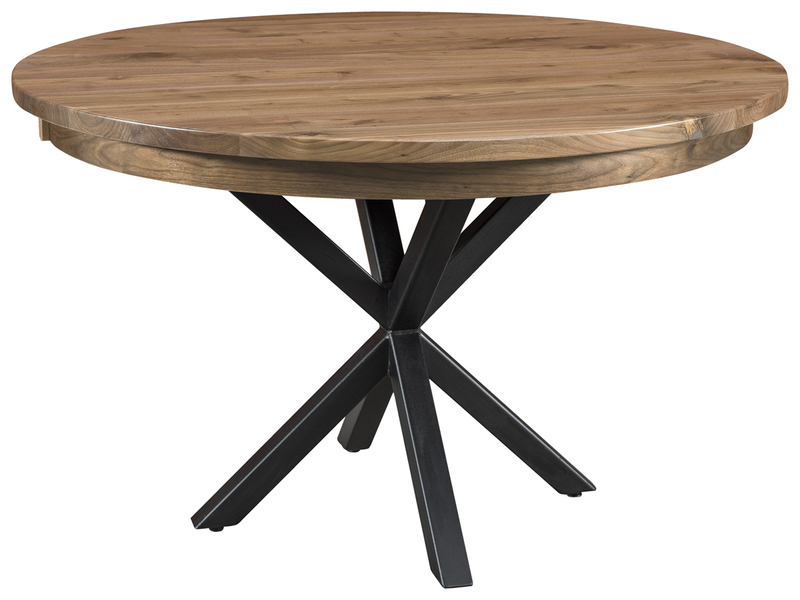 Our Prairie Mission Game Table enables your family and guests to take part in a challenging game of chess or checkers. 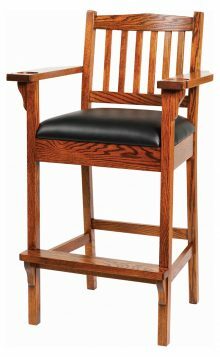 The attractive Shaker-style gameroom Chair is the perfect complement to your table and will allow you to enjoy the action in comfort. You Will Appreciate the Superior Quality of Our Amish-Made Furniture! If you’re tired of buying flimsy, fragile “bargain basement” furniture churned out in some overseas factory, then you’ll appreciate the quality and craftsmanship of our products. Every piece of gameroom furniture we sell is meticulously handcrafted in the USA by skilled Amish artisans who don’t believe in taking shortcuts or using inferior materials. Customize your pieces by choosing from attractive and durable hardwoods such as oak, cherry and maple, as well as from a wide range of gorgeous wood stains. While you’re loading up on toys and trinkets for your kid’s playroom, don’t forget to add the Prairie Mission game table to the list of playroom must-haves. Your kids will love practicing their chess and checkers skills on this game table. When it’s time for a snack, it even makes a perfect gathering spot for your kids and their friends to slow down and enjoy their juice and crackers. If you don’t have a room in your home dedicated to games, it’s likely your family room has taken on this responsibility. Spice up this space with a Prairie Mission game table and a few gameroom chairs, and you can sit back in amazement at just how much use your family gets out of them. The kitchen is a natural gathering place, and yet there is rarely any form of entertainment in this space beyond food. Switch it up by adding the Prairie Mission game table and a few gameroom chairs to your kitchen in place of a breakfast nook. This will encourage family and friends to play together rather than just eat together when they gather in your kitchen. These two pieces stand out as both fun and functional, so the options for matching décor are limitless. For the ultimate gameroom look and feel, throw a set of chess or checkers pieces atop the table and add a neon sign or two as well as some sports memorabilia. For a more understated and functional décor, leave the table clear of game pieces and use it as a dining space, play area, homework space or lounging oasis. The décor will likely depend on the area of your home in which you choose to keep your new Amish gameroom furniture. Most gamerooms double as entertainment rooms or family rooms, and vice versa, so it’s not uncommon to see furniture sets that were created and designed for one of these spaces to be paired with those from another. Additional Amish furniture sets that may blend well with your solid wood gameroom furniture include our Amish entertainment centers, our Amish stereo and media cabinets and any number of pieces found in our Amish living room furniture sets. Most of our pieces are available in Hickory, Maple, Rustic Cherry, Oak and Cherry to make mixing and matching sets a snap. When buying any type of furniture, it is important to make sure it is strong enough to survive the wear and tear it will endure over the years. Whether you plan to use these entertainment pieces on a daily basis or only on occasion, their durability is important. No one understands this better than the Amish, who pride themselves on the quality of their craftsmanship and the durability of their materials used to create each and every piece of furniture. You would be hard pressed to find another game table and chairs that will look better and last longer than these. We offer our customers many ways to save money. If you purchase any game room piece today, you’ll get up to 33% off the regular retail price. We also offer discounts for large orders and when paying for your furniture by check. You’ll discover the combination of well-made furniture and discounted prices provides excellent long-term value for your furniture-buying dollar. Please take a closer look at our current selection of solid wood Amish Game Room furniture. Have fun using the fun and convenient design tool you’ll find on every product page to experiment with different wood and stain combinations!